The Teeki Yoga Sun Shorts are mid-rise for more coverage and feel like a second skin. The durable eco-friendly 4-way stretch fabric is perfect for hot yoga. Teeki makes designer yoga clothing from recycled plastic PET bottles, whereby they show that yoga fashion goes very well with the environment and sustainability. The fabric is soft and comfortable and feels like a second skin. Originally developed for bikram and hot yoga (it also wicks away moisture quickly), but is also very suitable for less warm yoga styles and off the mat. Teeki is located in California. Even the whole making process of these beautiful yoga gear happens in the U.S.A. From making fibers from recycled plastic water bottles, to the fabrication of these fibers in combination with eco-friendly recycled polyester and spandex to a comfortable gentle high-tech 4-way stretch fabric. 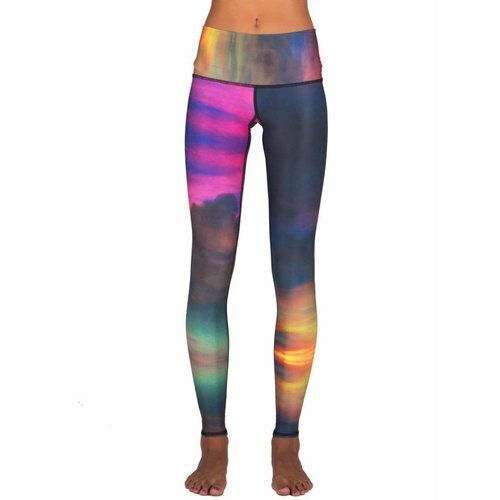 Even the eco-friendly printing of the fabrics and the hand stitching to beautiful yoga clothing happens entirely in the U.S.A. under proper and environmentally friendly conditions. With reason the slogan of Teeki is "Love the Earth". 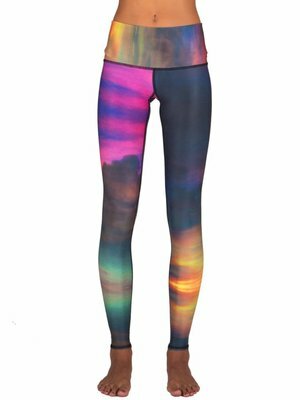 With prints like Phoenix Rising, Lightning in a Bottle and Clouds, Teeki shows that the prints on sustainable yoga clothing can be amazing. Yoga fashion meets sustainability! Since it not only feels great, but also looks amazing, you could also wear these yoga clothes during the day.